Took nearly two months of work to finally complete this 4 panel mosaic with around10 hours worth of open shutter time stacked and tracked with an equatorial mount. 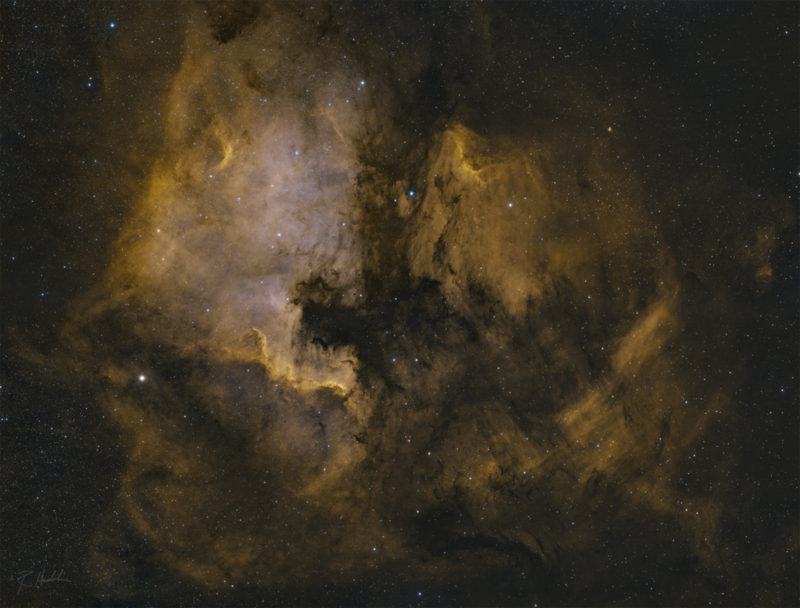 The North America Nebula (top left quadrant) is very large in the constellation Cygnus, covering an area 4+ times the size of the full moon. The North America Nebula and the nearby Pelican Nebula are parts of the same interstellar cloud of ionized hydrogen. Between the Earth and the nebula complex lies a band of interstellar dust that absorbs the light of stars and nebulae behind it, and thereby determines the shape as we see it. The nebula was discovered by William Herschel, from Slough, England, on October 24, 1786 and cataloged by his son John Herschel in 1833.